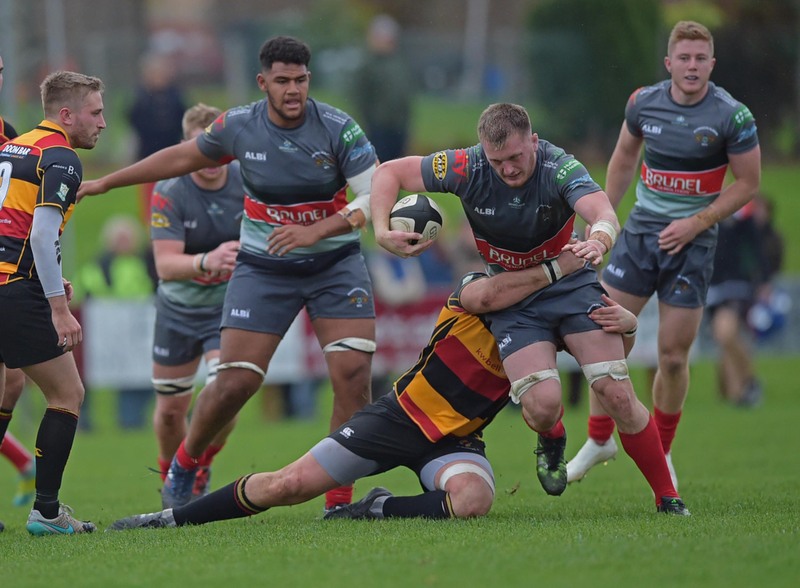 A delayed kick off by half an hour due to travel issues wasn’t a great start for Plymouth Albion in their match at Cinderford on Saturday. The first half saw the home side with the advantage of a strong wind behind them. Both teams play was even for the first twenty minutes before a penalty for a collapsed scrum was awarded to the home team, the Cinderford fly half made no mistake in sailing it through the posts on the wind. 3-0. Albion carried on pressing to get points on the score board, but Cinderford held firm and scored an unconverted try, to increase the home team’s lead to 8-0. However, Albion responded with two tries in quick succession with winger Jack Arnott stepping inside the Cinderford defence to go over for the first, and shortly after, some great handling found space for Rusi Tuima to score a try which Fraser Honey converted. Putting Albion into the lead and giving them the advantage going into half time 8-12. The second half started as the first finished, with Albion in the ascendancy, pinning Cinderford back in to their own half, forcing the home side to play into the strong wind. But it was the scrum that gave Cinderford their footing back into the game. Albion started to concede penalties and the home side were clearly buoyed by their dominance in that area. With penalty after penalty Cinderford started to gain field position and put the Albion line under pressure. Again, a penalty was awarded to Cinderford and from 5m out the home pack forced the Albion scrum backwards and to collapse, giving the referee no option but to award a penalty try. Moving Cinderford back into the lead 15-12. That would be all but Cinderford’s only visit into the Albion half during the second period however their defence held strong with wave after wave of Albion attack not able to break through, and with the line out finding it difficult in windy conditions Albion couldn’t find their way to the line for the crucial score. The brightest spark in the second half came in the last play of the game. With the clock on 80mins, Albion were awarded a free kick from a scrum. The forwards tapped and went and carried through some hard yards, before Dan Mugford came back to the blindside and unleashed Jack Arnott down the wing. Beating 2 or 3 defenders he broke clear of the defence, weaving his way down the field. Eventually the covering defence brought him down inside the 22 and as he tried to offload from the floor the ball came loose. Referee Nick Wood deemed it to go forwards ending the game and all Albion hopes of a win on the road.